Describing their work in Advanced Science, the research team started by taking biopsies of fatty tissues from abdominal structures known as the omentum in both humans and pigs. The tissue’s cellular materials were separated from those that weren’t and reprogrammed to become pluripotent stem cells, ” master cells” able to make cells from all three body layers with the potential to produce any cell or tissue in the body. The team then made the extracellular matrix – made up of collagen and glycoproteins – into a hydrogel used as the printing “ink”. 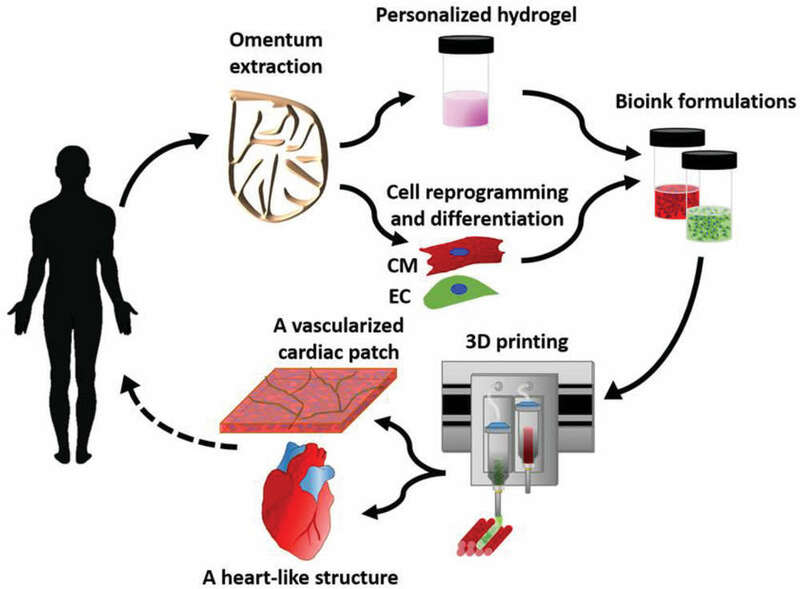 Cells were mixed with the hydrogel and then differentiated into cardiac or endothelial cells (those that line the interior surface of blood and lymphatic vessels) to create patient-specific, immune-compatible cardiac patches complete with blood vessels and, ultimately, an entire heart bioengineered from “native” patient-specific materials.